Samuel Shipman (1881-1937) was a successful writer of vaudeville sketches when he pitched a Broadway producer with a storyline for a full-length play. The producer liked the idea but wanted to read the finished script within a few days. Shipman needed a collaborator in order to write the script quickly. Aaron Hoffman (1880-1924) another writer whose work was popular with vaudeville comedians became the other half of the team. The two writers went to a hotel in Atlantic City, New Jersey and in five and a half days wrote Friendly Enemies. A few week later the play was ready to open for preview performances in Washington, D.C. The significant backstory is that Karl Pfeiffer and Henry Block are very close friends. They were born and raised in the same German town and they immigrated together to the United States when they were young men. Karl has always maintained the German culture in his home while Henry has adopted the American way of life. Karl’s son William is engaged to marry Henry’s daughter June. Act One: Karl, who is a German patriot, has been very unhappy since the United States entered the war against Germany. He promises Walter Stuart that he will donate fifty thousand dollars to reduce anti-German propaganda. Stuart, unbeknownst to Karl, is a German agent who will use the money to sabotage American war endeavors. The major segment of this act consists of Karl and Henry arguing about the war and the German way of life. They are both waiting for William to return home. Karl believes his son has been at college, but William has been in basic training since his enlistment in the United States Army. Karl’s wife, Marie, has kept her son’s secret as has June. William returns home and tells Karl the truth. Karl is very upset and leaves the house. Act II, Scene 1 takes place the next morning. The couple decided to marry today before William leaves on a transport ship for France. Karl returns home, but he refuses to go to City Hall for the wedding. Scene 2. The family members leave for the wedding. Stuart arrives for the promised money and Karl gives it to him. Once everyone returns to the house except William who has boarded his ship, Karl receives a telephone call. Stuart wants to share his good news--a ship has been sunk two miles from New York City harbor with five thousand American soldiers aboard. The ship is the one that William boarded after the wedding. Act III. Evening of the same day. A few minutes after eight o’clock. While everyone is heartbroken over the tragic news, it becomes known that Stuart is a German spy as well as saboteur. William has survived the sinking of the ship and he arrives home. Henry, who has important friends, arranges for William to be credited with Stuart’s arrest. This is the barest of plot outlines and it does not attempt to describe the humor in this play. Since Friendly Enemies was written by two writers with vaudeville credits, the characters of Karl and Henry have scenes of broad comic interaction regarding each man’s position about American culture. Another consideration relating to the plot of this play is that it tackled a very serious problem that was being played out in the United States once it entered World War One. There were more than 1.7 million German-born immigrants living in the United States when President Wilson declared war. Germans comprised the largest non-English speaking immigrant group in America. There were hundreds of German language publications printed in the United States and many of them and their readers were pro Germany. A large percentage of their readership as well as the publications asserted their Germanness and did not support the United States being in the war. As a result, an anti-German sentiment developed on the home-front. Friendly Enemies opened in New York City at the Hudson Theatre on July 22, 1918. It played for 440 performances. It starred Louis Mann (1865-1931) as Karl Pfeiffer and Sam Bernard (1863-1927) who was an English-born American vaudeville comedian as Henry Block. The Washington Post reported on April 27, 1919 that as of that date there were three touring companies presenting Friendly Enemies in the United States and Canada as well as three companies touring in England. The play was a tremendous success. Friendly Enemies opened with the new title of Uncle Sam in London, England at the Haymarket Theatre on February 11, 1919. Apparently, the play’s original title was initially misunderstood by Londoners prior to its opening. The Globe newspaper reported on February 12, 1919 that the play “had to combat an unfortunate belief that it was “pro-German.” Uncle Sam was acted by an entirely American company which occurred for the first time in a London production. Uncle Sam was received with enthusiasm and played for more than 250 performances. Two films were made of this play using its original title of Friendly Enemies. The first one was released in the United States in March 1925. It starred Lew Fields (1867-1941) as Karl Pfeiffer and Joe Weber (1867-1942) as Henry Block. This duo was the well-known comic team of Weber and Fields that were one of the most popular and profitable acts in vaudeville. This film was released in the United Kingdom in June 1926. The two actors were billed in England as “the greatest burlesque comedians of all time” and the film was successful on both sides of the Atlantic. The second film was made by United Artists in 1942. It starred Charles Winninger (1884-1969) as Karl Pfeiffer and Charles Ruggles (1886-1970) as Henry Block. Winninger had a vaudeville background and Ruggles was known for his numerous comedic film roles. This film did not get released in the United Kingdom until December 1946. Interest in Friendly Enemies was revived during the World War II years. The theatrical presentations tended to be produced by community theatres and other nonprofessional groups. This play obviously served to delight audiences throughout two grueling periods of war. 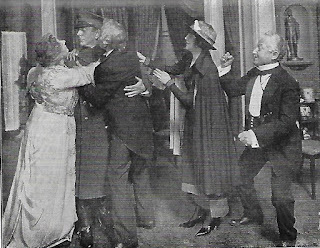 PHOTOS from the New York 1918 production appear in the script published by Samuel French, New York, 1923. Ernst Toller (1893-1939) wrote his first draft of Masses Man (Masse Mensch) in October 1919. It was his second play and it took him two and a half days to complete the first draft, but it took another year of hard work to shape it into a script ready for theatrical production. During the time he worked on this script, he was incarcerated in Fortress Niederschonenfeld, a military prison, in the Bavarian area of Germany. Toller was quickly able to set his ideas to paper since this play reflected the second major experience of his adult life. The first was fighting on the Western Front during World War One and the second was his leadership involvement in the Munich Revolution. During six days in April 1919, after the revolution was successful, Toller served as President of the Bavarian Soviet Republic. The violent events that were part of the revolution preyed heavily on Toller’s conscientious since he despised force and hated bloodshed. Toller had not followed his ideals. The writing of Masses Man depicts Toller working through his idealistic conflict. FIRST PICTURE. “Indicated: Backroom of a workers’ tavern. On whitewashed walls pictures of veterans’ clubs and portraits of heroes of the Masses. The play is set during World War One. The factory workers are planning to go on strike to force a peace settlement. They also want their actions to create a fairer society. The Woman’s Husband arrives to speak to her privately. The workers leave. HUSBAND works for the government and wants WOMAN to relinquish her present activities. WOMAN refuses even though she realizes her actions will end the marriage. SECOND PICTURE (Dream Picture). “Indicated: Hall of the Stock Exchange. CLERK at the desk, around him BANKERS and BROKERS. CLERK: face of THE HUSBAND. The Bankers are rejoicing over their war earnings. Suddenly it is announced that the battle on the Western Front is lost. The characters go into a panic over their perceived financial losses. THE COMPANION enters. His face bears a magic resemblance to THE WOMAN, who he leads into the room. THE WOMAN addresses the BANKERS as “human beings” and fades from the scene. The money men begin to discuss holding charitable events for human beings in need. THIRD PICTURE. The stage remains dark during the CHORUSES OF THE MASSES. Then the stage brightens to indicate THE GREAT HALL. “On the platform a long narrow table. THE WOMAN sits left. Suddenly out of the crowd, THE NAMELESS hurries to the platform. He stands to the right of the table. THE NAMELESS calls for more than a strike. He claims social justice can only be won by violent Revolution. Eventually even THE WOMAN is partially persuaded. FOURTH PICTURE (Dream Picture). “Indicated: Prison yard surrounded by high walls. From the corners of the courtyard WORKER-GUARDS appear. FIFTH PICTURE. Indicated: THE HALL. At long table THE WOMAN sits left. THE NAMELESS sits right. WORKER-GUARDS at doors. MEN and WOMEN WORKERS huddle at tables. OTHER WORKERS bring reports about the fighting that is taking place in the streets. The MASSES are losing the battle. The Hall is suddenly surrounded by SOLDIERS. When they enter the hall, THE WOMAN is identified as leader and she is shackled. SHACKLED PRISONER (face of THE WOMAN). PICTURE SEVEN. Prison Cell. THE WOMAN sits at table. 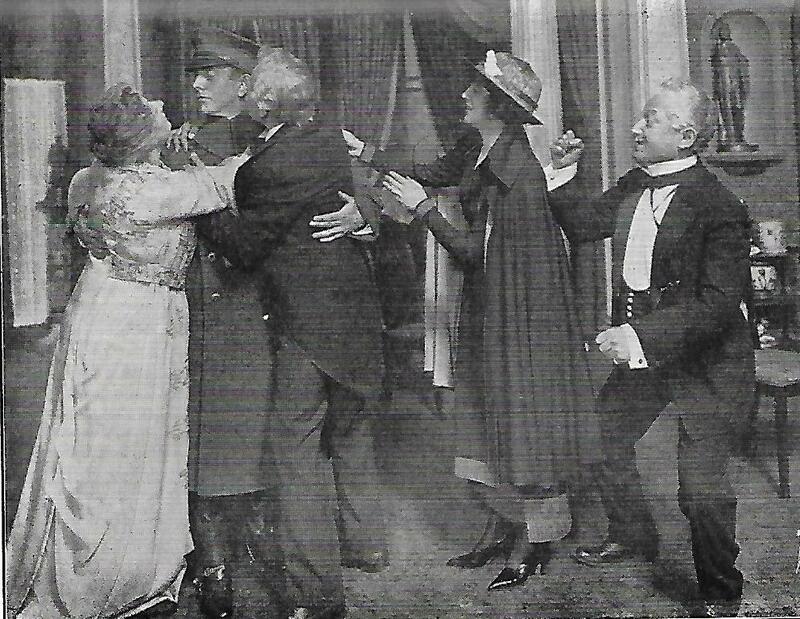 THE HUSBAND arrives to tell her that she has been found innocent of the shootings during the strike. They argue and he leaves. The NAMELESS arrives to free her. They debate about the MASSES. He grows tired of her position and leaves without freeing her. THE PRIEST arrives to ease her final time before leading her out of the cell to her execution. After a few seconds, two female PRISONERS enter the cell. They take a few items left by THE WOMAN, but quickly put them back after they hear a gun volley from outside. Toller’s sense of time and place are clearly delineated throughout the play. What my plot summary does not include is the emotional power of this play. Both THE WOMAN and THE NAMELESS are passionate about their positions and this heightened level of political emotion leaps off the page. I originally knew this play by the title Man and the Masses. This title was given by Louis H. Untermeyer (1885-1977) who translated it in 1923 for American audiences. The original British translation is titled Masses and Man. Vera Mendel translated this version sometime during 1923-24. I prefer the title Masses Man as translated by Alan Raphael Pearlman and published in 2000. (This is the version I read for this post.) Masses Man makes a clearer statement about the play for me. It has been frequently been understood that the earlier two titles refer to THE WOMAN who wants the strike to win the peace while the masses are persuaded to turn to revolution for the future of a better society. For me Masses Man refers to THE NAMELESS who persuades the masses to make their planned action into a violent revolution. 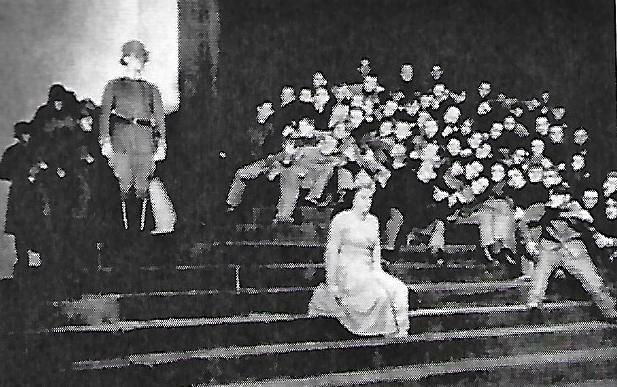 The first production of this play was staged on November 15, 1920 at the Nurnberg Stadttheater. The authorities had allowed a series of private performances for trades unionists. For the fourth performance on November 26th about one hundred tickets were offered at the door to non-unionists. Some of these tickets were purchased by individuals of different political beliefs and they staged disturbances during the performance. This event prohibited the theatre from presenting more performances in Nurembreg. Two more private performances of this production moved to the city of Furth in northern Bavaria. These events occurred prior to the play appearing in print. 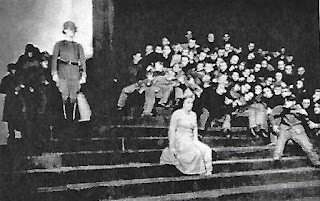 In February 1921 an amateur production was staged by the Municipal Committee for Adult Education in Chemnitz located in eastern Germany. The second professional production opened on September 29, 1921 and it was staged by Jurgen Fehling (1885-1968) at the Berlin Volksbuhne--a major theatre in Europe at this time. This staged version of Masses Man became its most renown production. The set designer was Hans Strohbach (1891-1949) and Heinz Thiessen (1887-1971) composed the music. Mary Dietrich played THE WOMAN, Ferdinand Asper’s role was THE NAMELESS and Heinz Bernecker, HUSBAND. A production opened in Moscow in 1923 at the Majakowski Theater. During the Spring of 1924 Masses Man was staged in both the United States and England. The American translation of the play was used for both productions. Man and the Masses opened in New York City on April 14, 1924 at the Garrick Theatre. 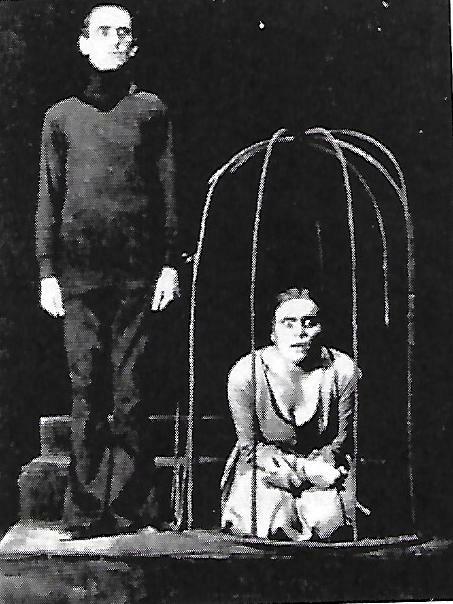 It was produced by the Theatre Guild and it ran for thirty-two performances. Lee Simonson (1885-1967 designed the scenery and staged this production. The London production opened May 1924 during the week of twentieth. It was produced by the Stage Society at the New Theatre. The initial performances were for private audiences, but it opened for the public later. 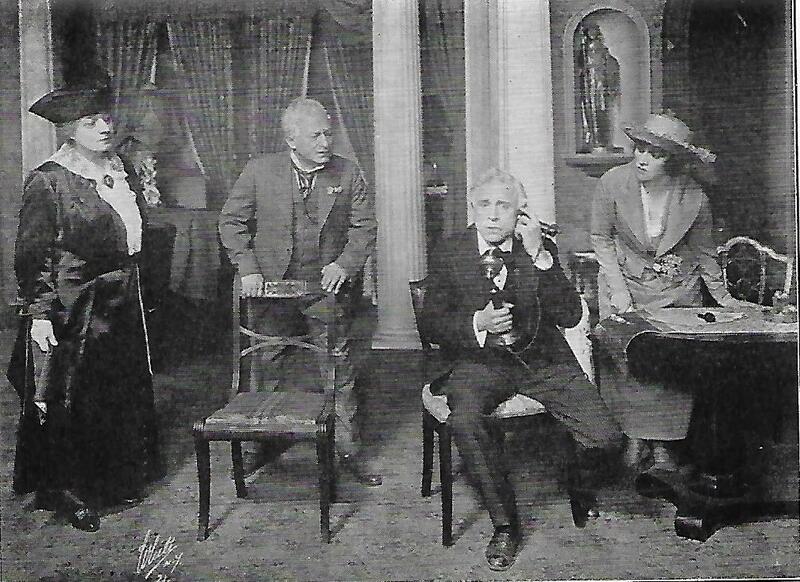 Sybil Thorndike (1882-1976) played THE WOMAN and George Hayes (1888-1967) played THE NAMELESS. John Foulds (1880-1939) composed the music. Masses Man has achieved the distinction world-wide of being the most well-known Expressionist play. 1. Alan Raphael Pearlman. Ernest Toller PLAYS ONE. London: Oberon Books Ltd., 2000. 2. THE WOMAN is also known in other translations as SONIA IRENE L.
3. This blog also has posts on other plays by Toller: Transformation and Hinkemann. 4. 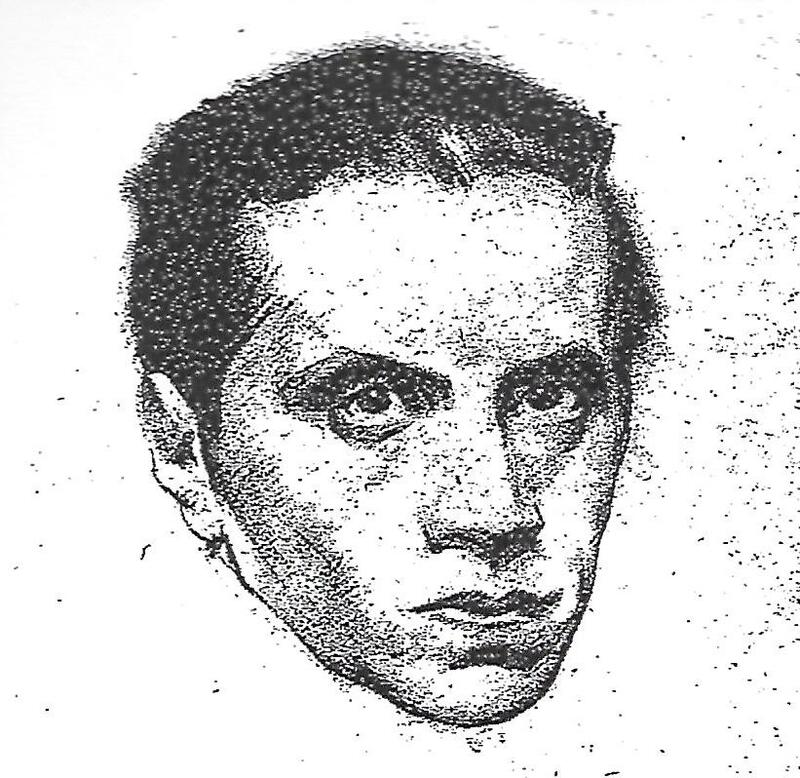 PHOTOS: Toller drawing by S. J. Woolf from Theatre Guild photo and it appeared in NEW YORK TIMES on August 12, 1923 (page 18). photos appear in same book cited in number 1 Note.